The Woods Ocean Grove is in the ultimate position for golfers on the Bellarine Peninsula. 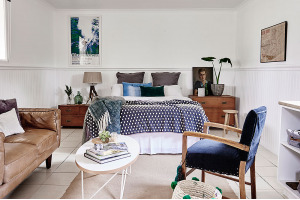 Tucked away on over an acre of secluded bushland and perfectly situated just a 10 minute drive to the area's most popular golf courses - Curlewis, Barwon Heads and 13th Beach, the cabins offer simple and relaxed accommodation perfect for golfing couples. Just minutes from Ocean Grove shopping, cafes, restuarants and beach, its also ideal for the 'non golfers' in the group. An ideal weekend away for 2 couples; the guys can enjoy their golf while the girls enjoy the beaches, cafes and local wineries.